Reminder: this is the 3rd and final part of my piece for the "First World Congress for Hallyu" (October 2013). The lecture had to be split into 3 parts to fit this blog's format. See Part I for the summary and 1st section, Part II for the 2nd section. Defining Hallyu: a simple wave, a current, or a vast ocean? Think nurturing beyond preserving: don’t build seawalls, grow mangroves! “Respect” is the key word in ethics. We’ve seen how important it is to respect nature and what it teaches us, to respect diversity within our own culture, or to respect other cultures as much as our own. Korea can leverage rich and diverse cultural assets to transform the “Korean wave” into a larger, stronger and more sustainable movement, and in many ways, Korean culture has already become an international model. But to reach beyond the “success story” dimension of the model, and to become a true cultural leader, the nation must make sure that its whole ecosystem is exemplary. No one owns culture, but everybody is a stakeholder and contributes: citizens, companies, associations, local authorities, governments… Korean culture radiates according to how each one behaves, impacting the way others perceive it (and by the way, most radiations happen to be waves). Nurturing an ethical, fair and open ecosystem is also a business imperative: not only to secure today’s activity, but also to generate new revenues in the future. Because culture is first about how people live, use time and space, those are fundamental dimensions where Korean culture can grow stronger and more sustainable. Korean culture success nowadays was also made possible because over the past decades, more Korean people have claimed more free time and space. Before the 1997 crisis, enjoying leisure time was almost considered a crime against national competitiveness, and now all the talk is about securing competitiveness through creativity. If creativity is not restricted to the happy few so-called “creative people”, a nation cannot decree creativity. Still, creativity can be stimulated and facilitated, potentially creative forces can be liberated to enable the miracle of creation, or the more simple miracle of creation meeting its public. A persistent gender inequality: impossible to develop grand things without empowering half of the nation. The focus is usually on around work and maternity, but empowerment must be total, and culture is an essential dimension for every individual. An aging society: senior citizens have not only a lot to share on Korean culture and its past, but also often both the time and motivation to contribute to its future. Local authorities are already inviting students to come share with them, but Korea also needs its elder citizens across its land and cities, to give sense to territories, to help re-cultivate them. The multicultural / international challenge: again, mixed families and foreign communities are a chance, and essential contributors to Korean culture. Seoul developed an expertise in leveraging energies from foreign communities to improve the daily life and cultural experience for all citizens, through the Seoul Global Center. Programs like Global Seoul Mates or Korea Clickers pool enthusiast bloggers from around the world to share about Korean culture and daily life. A pervasive competitiveness, a stressful work environment: the vast majority of cultural contents are now instantly generated and shared by ordinary citizens, and Korea is already leveraging an almost ubiquitous connectivity, multiplying participative / collaborative initiatives (sometimes in artistic projects, such as “Seoul Our Movie”, under the direction of Park Chan-wook). Slow life and slow food movements are also gaining momentum. At work, why not give employees time to develop pet projects, time for non-competitive, creative, collaborative activities? … the list could go on endlessly: again, a better, fairer society contributes to a better, fairer culture. The way space is used or misused is fundamental in the perception of a culture, and respecting the cultural potential of spaces is the first and most natural way of opening more space to culture. Korea long suffered from the scars of occupation, war, or the industrial boom, but each of them, in return, produced very valuable cultural assets, such as the old Seoul Station (now Culture Station 284), the DMZ, or the industrial heritage that became Incheon Art Platform. Seoul has evolved from a ‘hard city’ to a ‘soft city’ and a tourist magnet, and every city or county across Korea knows how to highlight their cultural assets. Unfortunately, the “new town” model continues to thrive, erasing whole neighborhoods with priceless cultural assets, or ruining cityscapes and even the countryside with uniform monoliths that negate not only the past, but all social and environmental trends. With Gyonam-dong, for instance, it’s not just hundreds of hanok, but also charming alleyways and villages that disappear. And the impact on the image of Korean culture is catastrophic: foreign visitors are chocked by the destruction, and mourn Seoul alleyways as much as they cry for Beijing hutong. Korea cannot herald creativity and diversity overseas if its cityscape negates them at home. Building without a long term vision is not an option anymore, particularly considering Korea’s demographics. Innovation and creativity are welcome, but some ‘touristic’ landmarks supposed to exhibit culture and creativity actually generate the opposite effect: because of overdone design, they look too flashy and artificial, and obsolete before they are even erected. Hopefully and at long last, Korea is starting to reconsider its urban and architectural heritage, to restore forsaken landmarks, to protect hanok clusters, waterways, and mountains, to give a new purpose to previously neglected spaces (even rooftops or wastelands), to grow culture from uncultivated land. Furthermore, beyond the structures, life spaces are revived, that were on the decline if not bound for destruction: traditional markets, charming neighborhoods, “moon villages”… The residents are either involved at the core of the project, like in Seochon’s Tongin Market, or at the origin of it, for instance when ordinary citizens reconquer their shared space to make it livelier and welcoming, sometimes with their own art that may look clumsy at times, but feels often fresher than many more ambitious and expensive projects. And when a place is condemned, why not leverage constructively from destruction, for instance by turning it into a cultural event in itself, or an opportunity to culturally strengthen a community? In Paris, the XIIIth District and Itinerrance art gallery secretly invited tens of street artists from around the world to transform an old apartment tower into an ephemeral street art museum (Tour Paris 13). In Seoul, the residents of Bogwang-dong were invited to collaborate on a book collecting memories of the neighborhood about to be destroyed. For years, the Seoul Museum of History has been leading a considerable effort to stimulate a dynamic preservation and transmission of micro-cultures and memories across a city that has lost a lot of villages over the past decades, looking for the soul of Seoul directly at the heart of its neighborhoods and citizens. Beauty and emotion don’t necessarily come from the most glamorous places, people, or moments. Thanks to such great photographers as CHOI Min-shik or KIM Ki-chan, the Korean and beyond, the World’s cultural heritage is richer in touching moments exposing life, cities, and humans as they truly are. The previous section focused on ordinary citizens and life spaces because they are too often overlooked when culture is mentioned, but of course Korea boasts vast communities of talented artists, associations, and professionals in cultural sectors, and over the past decades the nation has considerably multiplied its spaces devoted to culture (museums, galleries, libraries, event venues…). The following sections focus on the ‘economic’ dimension of Korean culture. Because at the business level too, Korean society’s strengths, weaknesses, opportunities and threats find their mirror image in Korean culture, which will grow stronger and more sustainable as the ecosystem becomes more open and fair. Before raising issues specific to the ‘culture business’, let’s start with Korea’s business culture. And in Korean business culture, the lack of fairness is clearly identified as a key obstacle to growth, innovation, and creativity. Besides, cultural change at this level is a recurrent political priority, be it in Lee Myung-bak’s ‘fair society’, Roh Moo-hyun’s ‘balanced national development’, or Park Geun-hye’s ‘creative economy’ visions. If this culture of unfairness permeates the whole economy, Chaebol stand out as 800-pound gorillas showing the wrong example: they’re often blamed for controlling value chains and key entry points from the production to the distribution, or for sharing little of the value with third parties. Even with the emergence of the internet and one-click-away competition, small and medium players struggle to emerge and survive. The strongest ecosystems do need big fishes, but also thriving independent communities, significant challengers that are allowed to grow into big fishes, a wide array of players that spur creativity and bring positive changes benefiting the whole market, starting with the ‘big fishes’ who share a much bigger pie and learn how to evolve constantly, gaining in fitness and in relevance in a coopetitive world and a genuine network society. Hopefully, ‘Big fishes’ are starting to realize that an ocean without biodiversity is a dead ocean, that absorbing or choking the most promising fry as soon as they hatch undermines innovation and long term value for themselves as well as for the whole market, that ultimately, evolution is the only way for them to save the Korean seas they live in, and to succeed in more open waters. And you can’t survive by growing your own ecosystem, even with the best in-house incubators. AOL thought they could control the ocean, they dominated internet access in its early stages, but even after absorbing Time Warner, they lost their leadership because fundamentally, they didn’t evolve and open up to adapt to a truly open web. Just like they play a major role in Korean society, Korean corporations and chaebol often play leading roles in the promotion of Korean culture, and even when they are not directly present in cultural sectors, most groups own art foundations, support creation, design, or cultural preservation. But only a few can be considered as true cultural leaders: because they’ve already embraced the long overdue Korean revolution in business culture, they’re already followed as ethical models, and respected because they are respectful of the ecosystem, not because they are feared. Naturally, for Hallyu, nowhere is this “economic culture change” more urgent than at its core, particularly around the production and distribution of cultural contents, where a few cases of unfair business practices can cast a very negative impact on the whole industry, and Korea. For instance, as K-pop became mainstream in Europe, scores of journalists came to investigate the phenomenon in Korea, quickly exposing the dark side of the industry in sensational documentaries denouncing cases of abusive contracts and working conditions. Because they exposed moral scandals, they hurt much more than the classic criticisms that denounced a ‘culture industry’. Last April, the Korean movie industry agreed on a standard labor contract that ended a long tradition of exploitation of film crews. A lot remains to be done, for instance to reward creators and scenarists or to better redistribute value across the ecosystem according to international standards, but the single fact that major producers, distributors, and labor unions collaborated with a shared ethical vision marked a very significant change. Here too, everybody wins in the end, including audiences that are more likely to enjoy a great movie. Here too, and particularly as Korean players emerge in the international spotlight, turning a blind eye to wrong practices is not an option anymore; to the contrary, fighting against them must be a priority. Even in Hollywood, the usual suspect for ‘big entertainment’ accusations and not exactly the symbol morality and fair business, they’re very bad PR if you’re running for an Academy Award! Of course, in cultural sectors like everywhere, Korea boasts several ‘big fishes’, such as “majors” in entertainment and communication, that are often at the same time key assets at the global level, and enjoying dominant positions on markets where independents have a tough time being distributed beyond YouTube and minor venues or theaters, even if content-wise, the “indie” tradition is very strong in Korea. Significantly, KIM Ki-duk is more popular in France than in Korea where, even after claiming the prestigious Golden Lion in Venice Festival, the director cannot be screened on prime time in multiplexes that mostly rely on blockbusters and in-house productions. According to Korean Film Council (KOFIC) data, concentration keeps rising and diversity decreasing: the top 3 multiplex groups raised their share of screenings from 62.2 to 86.7% between 2008 and 2011, and reduced their proportion of independent movies screenings from 7-10% to 1-2% between 2009 and 2012. The Korean public is no more trained for diversity on smaller screens: even with many cable TV movie channels, the variety remains very low, particularly on prime time. There is no point creating a mangrove if diversity is not supported within it and typically, Korean screen quotas should not be considered at the nationality level only: in France, respecting cultural diversity, financing and screening independent creation are obligations broadcasters must follow if they want to keep their licenses. And because more audiences have developed a taste for a wider variety of movies, at home and in theaters, multiplexes can optimize their revenues even when blockbusters fail to deliver, leveraging a much wider catalog of movies, including of course many indies. Again, everybody wins, and the pie grows bigger. It’s also high time to tear down the artificial seawalls erected within the local ecosystem. When every major broadcaster propose their own yearly TV awards, rewarding only in-house programs, it tells a lot about the room for improvement. And change is coming PSY showed a very positive example by inviting stars from rival talent agencies in his videos. If Hallyu is a national cause, all stakeholders must collaborate to make this very rich ecosystem reach its full potential. This will take new regulations, new shared platforms, more cultural leadership from market leaders. Seoul Digital Media City has been designed for that moment, as a key convergence point rich in infrastructures and incubators where, ultimately, all players shall cohabit, cooperate, coopete for their common good in a cluster that could become a global model. They already proved they could work together, they must show the way for the rest of the nation. As true cultural leaders. Korean culture is a rich and diverse ocean in motion. We’ve barely scratched its surface today, but Koreans are particularly aware of its value (starting with such essentials as Hangeul or hansik), and not just because its very existence has been threatened in the past, or because education and literature have traditionally been considered more important than material matters. They all know that it is a defining part of themselves, they feel eager to share it, and the same can be said from foreigners who fell in love with Korean culture. This contagious passion is one of the most formidable strengths of Korean culture, maybe the very spirit of Hallyu. Again, the main challenge may not be letting other people know that this vast ocean in motion exists, but trying not to overwhelm everybody with our enthusiasm! 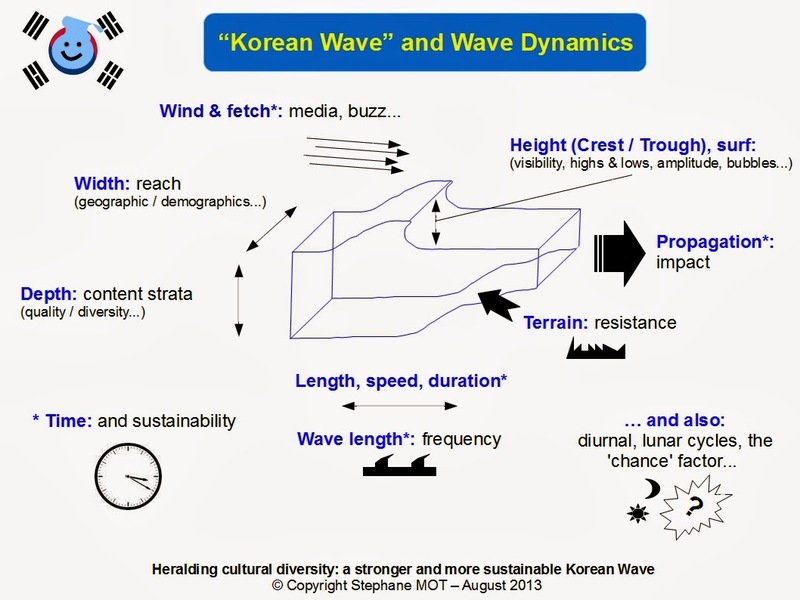 * see "Heralding cultural diversity: a stronger and more sustainable Korean wave (1st Congress - WAHS)"